The Rondeau is extremely versatile and can be used on the hob or in the oven and with its lovely little lug handles it means you can place it centrally in the oven. I can't write enough great reviews about these pans, just like everyone else who has purchased one. They are brilliant for cooking, end of. 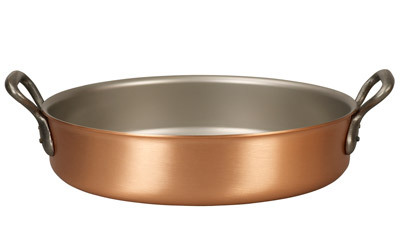 Very versatile and perfect for my smaller kitchen this pan is used almost daily. What a product! We use this dish almost daily; it is so versatile and perfect for everything! We shall be buying many more pans from Falk. 609 customers found this review helpful. Did you? Yes, I did! Purchased this as its a perfect size for us. I hadn't realised just how attractive the Rondeau is, it is perfect for serving at the table and really impresses. We are absolutely delighted with the 24cm Rondeau and matching lid - the latest addition to our growing collection of Falk Copper pots. Excellent for stews, sautés and gratins - it is a delight to cook with, and looks very stylish on the table. Very helpful advice from Neil on which pans to buy, and first class delivery service - we look forward to adding yet more pans to our collection. 653 customers found this review helpful. Did you? Yes, I did! The fact that this pan only has side handles is great on our small cooker (doesn't take up so much space). The pan is easy to transfer from hob to oven and is very versatile. As always, the service offered by Carol and Neil is second to none. 545 customers found this review helpful. Did you? Yes, I did! I already love Faulk pans, they just ooze quality. It goes without saying the workmanship and materials are second to none. 602 customers found this review helpful. Did you? Yes, I did! This is just right for a meal for 4 people and the quality is fantastic. I bought this pan in the piece of the month sale and to be honest, I don’t know why I waited so long (though I was glad to get it at such a good price)! I’ve always loved the versatility of a rondeau and when that’s combined with the heat conduction of copper and the quality of Falk manufacturing, it really does result in a great pan that’ll be in constant use. One of my favourite Falk pieces, and that’s saying something. 657 customers found this review helpful. Did you? Yes, I did!